Gilbert and Sullivan are never going to appeal some people. High-brow opera aficionados will most likely turn their nose up in distaste whilst theatre connoisseurs will wryly shake their head before searching out a disused prison for the latest in immersive theatre. People who don’t go the theatre will probably just be entirely baffled by the whole experience. For those who like Gilbert and Sullivan the joy is that they manage to keep themselves outside of any particular bracket. They are just who they are, and you feel that their operettas achieve precisely what they wanted them to achieve. 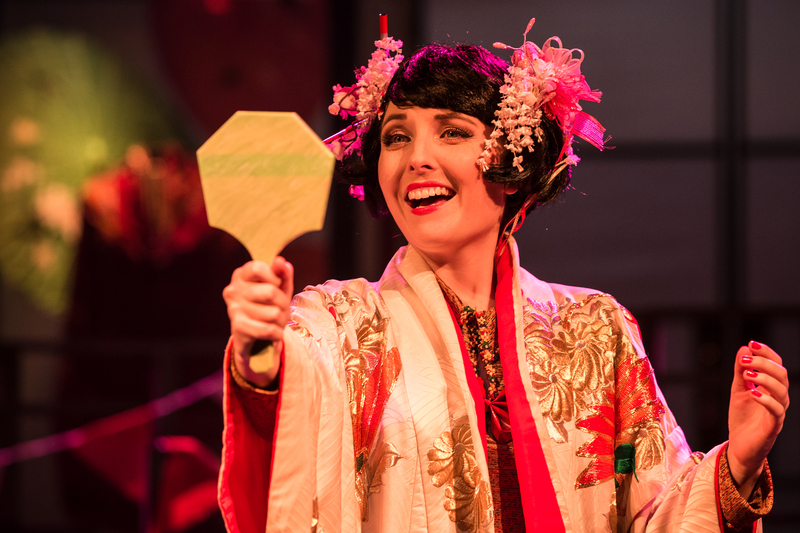 Make no mistake: The Mikado is an absolutely ludicrous show and so much better for it. Thom Southerland, who has a number of recent notable fringe musical successes under his belt, understands this and pitches the show in a bizarre 1930’s factory that makes absolutely no logical sense to the plot but which allows a free-wheeling lunacy to give the show a hugely infectious, if slightly demented, charm. Southerland’s choice of location helps remove the focus from Japan, and as a result some of the slightly more knuckle-chewingly inappropriate reference points are adroitly side-stepped. In fact the result of updating the plot is that it actually makes it easier to see how Gilbert and Sullivan could be a precursor to the likes of Cole Porter and Irving Berlin, and perhaps they deserve more recognition in the creation of what we understand musicals to be. Anything Goes is one of the great musicals but the plot itself is pure hokum, and really how different is The Mikado? Both are full of memorable songs, some great jokes and end in marriages. The link to American musicals is aided by some sparkling choreography from two-time Tony Award nominee, Joey McKneely. It is quite clear that McKneely is someone who knows what they are doing. He has drilled the ensemble into some fine, spirited work on a small stage. Indeed some of the energy is so high you worry that they are about to tip off the front and severely disrupt the two folk bashing away on the baby grand pianos that provide the musical accompaniment. The result of all of this is that The Mikado moves away from an operetta that seems like it wants to be an opera, and instead becomes more like a musical with some particularly fancy songs in it. One of the joys of this approach is that you can actually understand what the cast are singing about – and they do make some effort to enunciate the lyrics. This is to particularly good effect in Ko-Ko (Hugh Osborne) list of those who will ‘never be missed’ which has been nicely updated to reflect the state of modern society – a nice nod to the original satirical purpose of much of Gilbert & Sullivan’s work. The performances are very good with the standouts being a delightfully fey Nanki-Poo (Matthew Crowe). Dressed as a late-era Edwardian just back from a boating party one did rather wonder how he would have stolen the heart of the rather more forward Yum-Yum, however Crowe really grows in the part and has some lovely comic timing. Osborne was perfectly cast as Ko-Ko the executioner and really captures the everyman spirit of the part; helping to move the role out of a slightly sleazy ‘protector’ figure who plans to marry his ward and towards someone you can begin to empathize with. The two female leads, Rebecca Caine as Katisha and Leigh Coggins as Yum-Yum, possess the powerhouse voices of the show and as a result rather risk overshadowing their male counterparts but they lend a certain quality that brings the show back to its operatic roots. Caine also provides some much needed depth of character to Katisha, which risks becoming a pretty thankless role. There is a sense of fragility and desperation to her action that actually manages to cut through the glossy fun of the evening. The show is enhanced considerably by Philip Lindley’s set design, which is a thing of beauty in itself and is perfectly pitched for the period. It appears to have drawn inspiration in equal parts from the classic travel posters of the interwar years, Japanese minimalism and Are You Being Served? 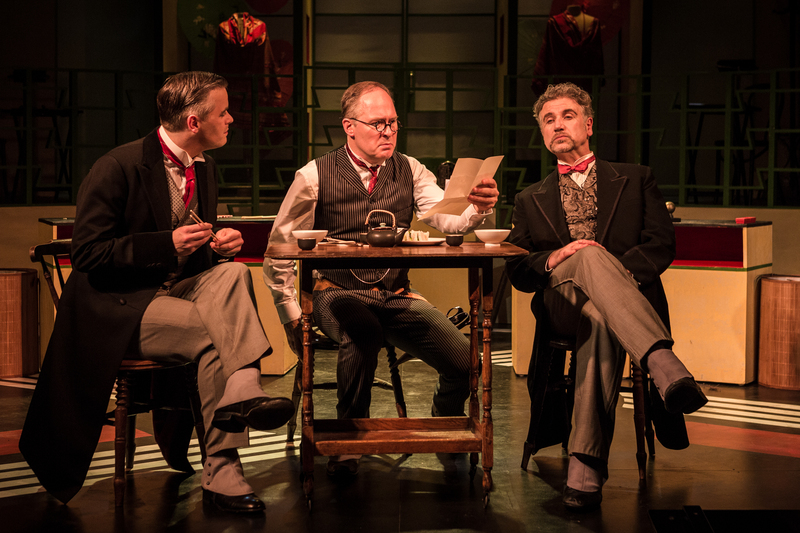 Indeed the arrival of The Mikado in the second half could have doubled for the entrance of Young Mr Grace onto the floor of his famous department store. Also worth mentioning are Jonathan Lipman’s costumes, which provide a sense of period flair, from the flapper-like appearance of the ‘three little maids’ to Katisha’s outfit that could have led to running a seance in a particularly ropey episode of Poirot. Overall The Mikado proved to be a much more satisfying night out than I was anticipating. It is a little long and I know that others have complained of a lack of amplification so I would suggest sitting near the front if possible. 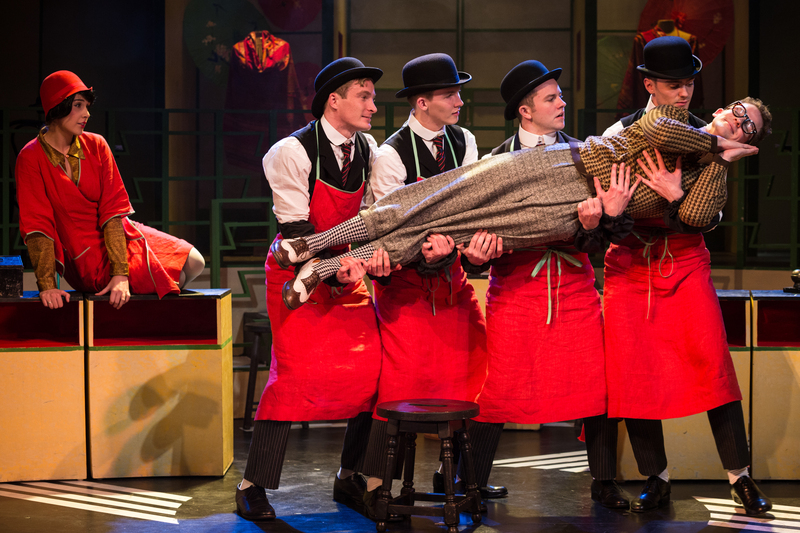 However if you are looking at West End musicals this Christmas, are feeling a little uninspired and want something fun, warm and traditional then The Mikado may prove just as satisfying as any pantomime.